Are you having a good week? It’s a little cooler so I am thrilled. Did I mention how much I enjoy doing these comparisons? I have another one today requested by acidicice. I have Sinful Colors – Charmed and China Glaze – Glistening Snow to compare. Let’s take a look and then I will give you my opinion. Here you can see that Charmed is definitely more silver than Glistening snow. 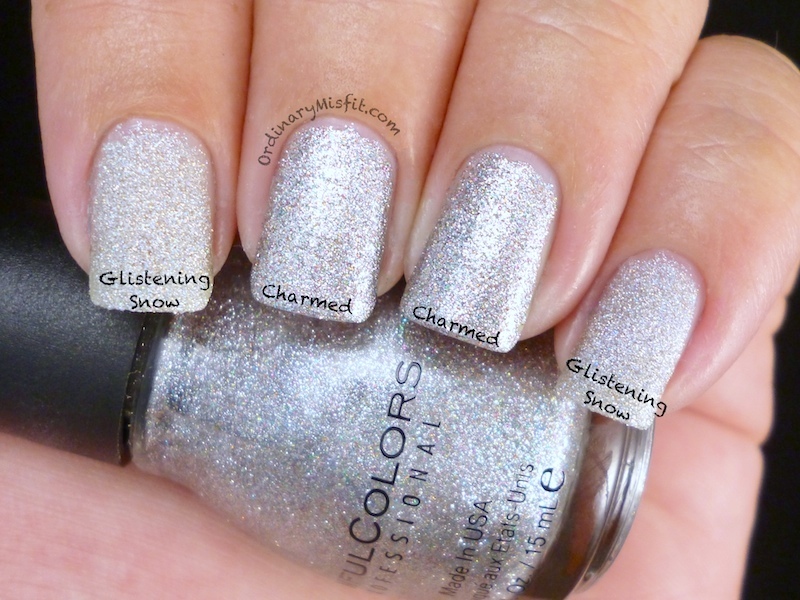 In my opinion, Glistening snow is a more whitish silver glitter with tons of holo glitter in. Charmed is more silver but with a little less holo glitter. If you don’t look this close up and in real life then you might not notice the difference that much. They are not dupes at all but the big question: Do you need both? I guess technically the answer is no. They are similar enough to not need both but if you’re like me then heck why not right? I think it depends on what kind silvery look you prefer. If you want to compare these two in another circumstance then have a look at this. I did a guest post on Lipgloss is my drug that you can see here using glistening snow and acidicice did exactly the same design here using charmed. What do you think? I like Charmed more. I see it is a little bit more on the silver side than Glistening snow which looks whiter. Both are simply beautiful though. Thank you. Yes I also think Charmed is a little more silver. I found that My Glistening Glow dries matte and almost textured unless a topcoat is used. Hahaha you better believe it. Yes I think Charmed is more silver so more obvious. You’re right. In real life the difference is even less obvious. What about charmed compared to fairy dust? Is charmed glitter pieces way bigger? I don’t have Fairy Dust unfortunately (I have a Sinful Colors dupe) but yes Charmed is much more dense and bigger glitter. They are dense enough to wear on their own but fairy dust needs to be layered over something. Thanks so much for this post! Looking at these pics, to me the Glistening Snow looks like it has a gold tone to it (maybe it is the holo? ), maybe because it is next to the very silver Charmed. I really love Charmed! I don’t think I need both. Yay! It doesn’t really have a gold tone to it IRL but the holo might be inclined to be gold-esque. I think if you’re looking for a silver then Charmed is the way to go. Much more versatile too.